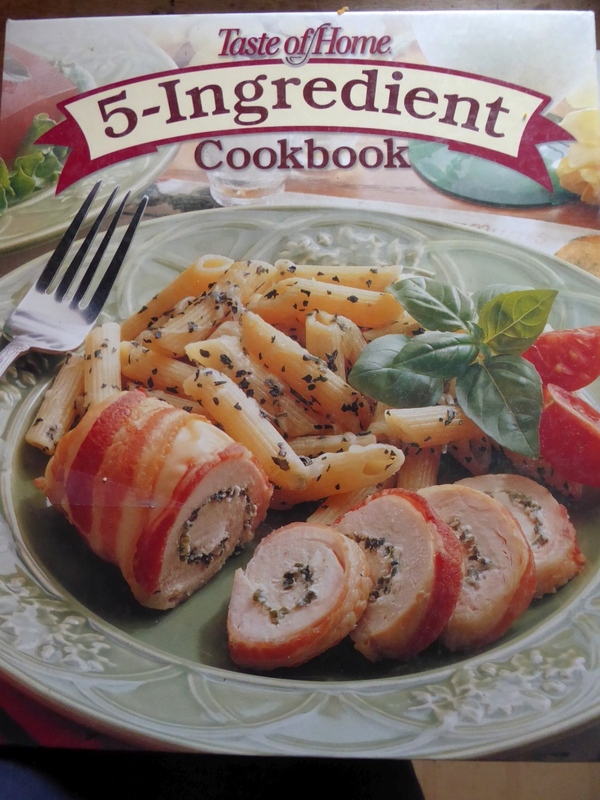 I found a new cookbook at a thrift store for $1. I'm not the most creative person in the kitchen, so usually cookbooks aren't my favorite choice of literature. But this one is an exception. It has a rare combination of delicious recipes, lovely graphics, easy instructions, and simple ingredients. 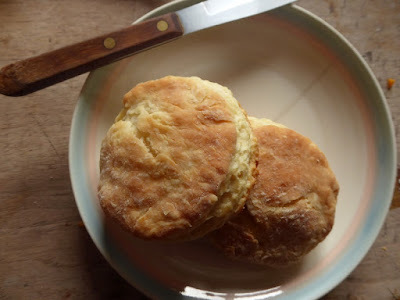 Anyway, I had a bit of buttermilk left over from Thanksgiving and wanted to use it up before it went bad, so I decided to try the Southern Buttermilk Biscuits recipe found in my new purchase. Since our wood cookstove is always in use now that it's winter, I've switched to using it almost exclusively for cooking and baking purposes. My only complaint with this superb stove is the oven is small, but it's perfect for biscuits. Maybe it's a psychological thing, but stuff that comes out of a wood cookstove oven always seems to be perfect. In this case, golden and beautiful. For such a simple recipe, these biscuits were absolutely phenomenally delicious. They're a new favorite. 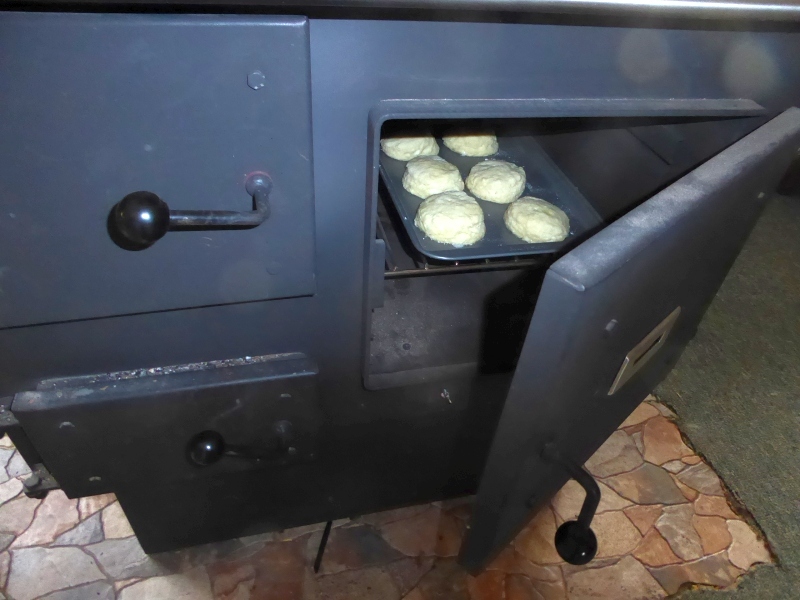 A new cookbook, and a wood cookstove. It's the little things in life. "Book a flight to Florida, rent a car, travel to the nearest beach, and dip out some ocean water. Return home, evaporate the water to produce two tablespoons of sea salt..."
Bah, ha, ha! I had the same experience! We always joke that the M. Stewart recipes are, like, "Obtain the very best vanilla beans from the east side of the island of Djibouti. If you do not have these magical beans, your recipe will be utterly ruined." Ha, ha. I mean, I appreciate her commitment to excellence but sometimes I just need dinner on the table like ten minutes ago! 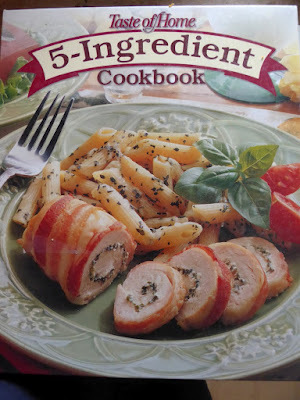 I learned to cook from Taste of Home and five ingredients sounds just about perfect to me. I'll have to keep my eye open for that cookbook. I am going to try that recipe. I have never been able to make decent biscuits. Did you know that you can get powdered buttermilk for baking. 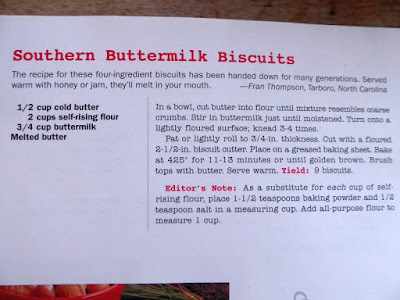 That is what I use since we very seldom use buttermilk (pie and fried fish are about it). It keeps in the frig. I fell in love with Taste of Home magazine after a neighbor let me borrow one of hers. They always have great recipes. Now I take the books from the library and read the magazine on line thru Zinio. And, I usually find 2 or 3 recipes to try. Bake at 400 degrees about 25 minutes. Yum! Always look over a cookbook before buying. I hate to find out later it's mostly dishes like roasted eggplant with spinach sauce or Brussels sprouts with pork snouts. Too many pages of thing my people won't eat. I enjoy that magazine, too, and I've cooked in restaurants and gone to culinary school! 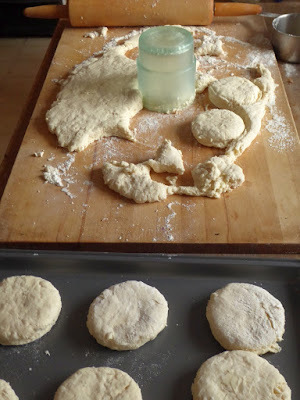 Tip on the biscuits: yes, you can use a glass, but you will get a better rise if you use a SHARP cutter and go straight down, no twisting. You biscuits are beautifully browned! If you put them on the baking sheet just barely touching each other they will rise straight up. And anonymous is right....use a sharp cutter & DON'T twist.Merry Christmas to you & our family. Anyone that can find joy in a $1 cookbook from a thrift store is my kind of people - love it!! Haha! Mocking Martha Stewart's unreasonable expectations is something we enjoy here, too. Thrift stores are the best for finding great books. That's the recipe my grandmother used and she learned on a wood stove. Although, by my time, she was using shortening. I've made them with butter, shortening or both to good results. 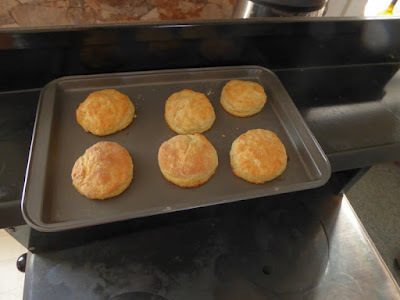 My grandmother also showed me drop biscuits. They are speedier as you just drop spoonfuls of the biscuit dough on the pan rather than rolling them out. They don't neatly split for spreading, but are light fluffy mountains and perfect for sopping. To elaborate on anonymous, the sharp cutter reduces the pinching of the sides of the dough together. 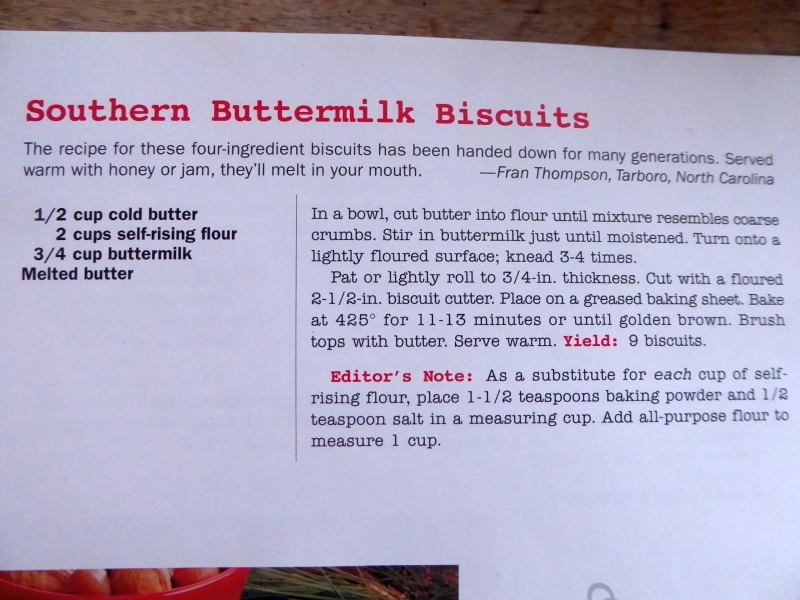 This permits the sides to rise in the baking for tall, level biscuits. But, But I'm looking for a simple cook book that doesn't say " one can of ...."
Using can of doesn't fit my definition of cooking from scratch. Don't buy a biscuit cutter, use a can opener that takes the whole top off of a vegetable or soup can and use it. "... I found a massive Martha Stewart cookbook in a thrift store for $5 ... I re-donated the book to the same thrift store ..."
We'd have cut the spine out of it and re-glued sections into solid bricks so we could use them as range targets. I found my favorite Christmas cookie in a good will cookbook. We get so many books at good will. From .50-$1.00! Nearly all kids books come from there since I find so many classics there. Love! Oh And fyi we finally found a cash and carry store! So excited. I've been looking for one from years of reading about yours. BLESSINGS TO YOU ALL THIS CHRISTMAS!